Devanāgarī (देवनागरी) is a system used to write several Indian languages, includingSanskrit, Hindi, Marathi, Kashmiri, Sindhi, and Nepali. Devanagari is a form of alphabetcalled an abugida, as each consonant has an inherent vowel (a), that can be changed with the different vowel signs. It is a close descendant of the Brāhmī script that has been traced back to 500 BC. The Brahmi script, in turn, is derived from the Eastern Aramaic alphabet. Many other Indian languages are written using other scripts in the Brahmic family. The name Devanagari is of dubious etymology. It comes from the Sanskrit words Deva(god), and Nagari (city); together they mean, literally, "City of the Gods". This refers to a legend that the script was used in such a city. The philosophy behind it is that when one meditates on the specific sounds of the Devanagari alphabet, the written forms appear spontaneously in the mind. The compound really functions as a bahuvrihi. "Devanagari" is the most common transliteration of the name of script. Others are "Devnagri", "Devanagri", and "Deonagri" (rare). Devanagari is written from left to right. Words are written together without spaces, so that the top bar is unbroken, although there are some exceptions to this rule. The break of the top line primarily marks breath groups. Devanagari has no case distinction, i.e. nomajuscule and minuscule letters. The spelling of languages written in Devanagari is partly phonetic in the sense that a word written in it can only be pronounced in one way, but not all possible pronunciations can be written perfectly. 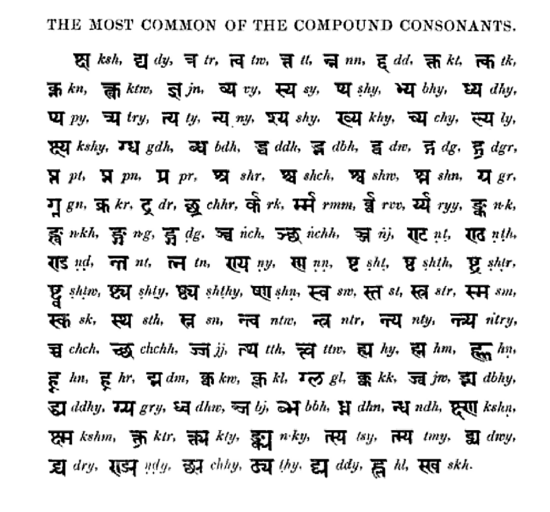 Devanagari has 34 consonants (vyanjan), and 12 vowels (svar). A syllable (akshar) is formed by the combination of zero or one consonants and one vowel. The transliterations in the following tables follow the popular National Library at Calcutta romanization. The ITRANS notation  is a lossless transliteration scheme of Devanagari into English. The letters used to represent Devanagari alphabets in this notation have approximately the same pronunciation in English. It is widely used on Usenet. In ITRANS, the word Devanagari is written as "devanaagarii". Note: Unicode support and fonts containing Devanagari characters are required to display the Devanagari on this page, which may be found here. All the vowels in Devanagari are attached to the top or bottom of the consonant or to an AA vowel sign attached to the right of the consonant, with the exception of the I vowel sign, which is attached on the left. In the Devanagari vowel table below, the "Letter" column contains the symbol used when a vowel occurs without a consonant, the "Vowel sign" column contains the symbol used when a vowel is attached to a consonant, and the "Vowel with [p]" column show an example of the vowel symbol, attached to the "p" consonant. The "Unicode name" column contains the name given in the Unicodespecification for the vowel, and the "IPA" column contains the International Phonetic Alphabet character(s) corresponding to the Devanagari vowel. ् प् VIRAMA Called halant; suppresses the inherent vowel. When no vowel is written, 'a' is assumed. To specifically denote the absence of a vowel, a halant (also called virama) is used. Among these, ळ is not used in Hindi. The entire set is used in Marathi.